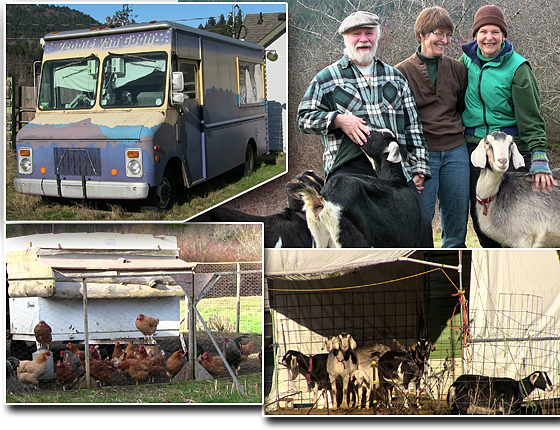 We were welcomed at EcoReality Co-op by Jan Steinman and Cleome Rowe (top right) and the goats. 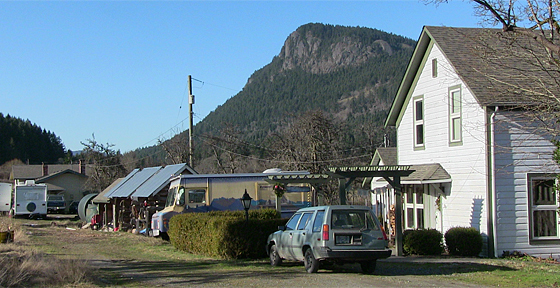 EcoReality Co-op is an ecovillage at the southern tip of Salt Spring Island working to be a model of cooperative, sustainable land habitation and land use. Jan’s “Veggie Van Gogh” truck (top left) took me back to the early 1970s when I bought the identical vehicle (used) to convert to a motorhome and travel like we’re doing now. I named it “Van Gogh”, loving the pun. Looks like that model of delivery truck knows what its name is! Jan’s farm is sprinkled with clever re-purposing. Camper shells and travel trailers get a second life as goat shelters and chicken houses. Our mobile studio felt in good company with other RVs which provide temporary housing for farm interns. Are you looking for intentional community? EcoReality Co-op is organized as a not-for-profit cooperative organic Permaculture farm. It’s seeking additional member-funders to help pay off debt, build new naturally-built housing, grow food, and produce renewable energy. Various levels of involvement are available, from being on their email newsletter list, to buying a share of their goat herd and raw milk production, to funding particular projects, to having a share in the land and permanent habitation rights. Rising above the 19th century farmhouse is Mount Maxwell, which affords a spectacular view of the south gulf islands. 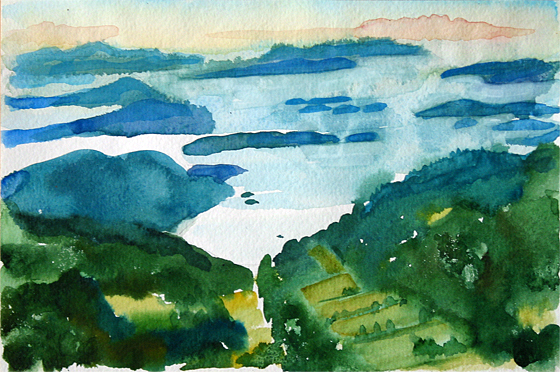 We climbed it one sleety day, where I painted this watercolor. EcoReality is at the bottom right. My name is Thomas Kamiya who was a member of WWOOF-CANADA (2010 ~ 2011 ), USA (2012 ) , JAPAN ( 2013 ~ 2014 ) , a retired certified heavy-duty mechanic from Vancouver , BC . Since retiring in 2009 , I have visited organic farms across Canada ( 100 ) , USA ( 55 ) , JAPAN ( 100 ) to teach farmers the skills and strategies to keep their equipment in good working order . Also I can be doing to help out with daily farm tasks . I am doing this because I am interested in healthy living , particularly organic farming and foods and its contribution to public health .